Human Resources Training Bundle for training HR Managers. Confidently develop a strong HR department by utilizing over 15 different crutial topics. Teach HR Managers how to handle change management, orientations, performance management, manage customer service and more! As senior level administrators begin to acknowledge the advantages of workplace education, they are taking training more seriously. They are realizing the benefits of having an experienced team of human resources mangers and specialists. 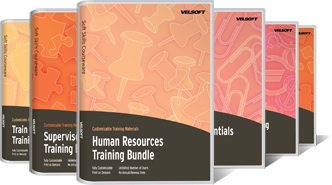 Our Human Resources Bundle of customizable training materials is the ultimate resource for instructors teaching all aspects of human resource management. There is no more effective way of introducing foundational concepts of human resource management than giving students a positive learning experience. Your students will be trained in all areas of human resource management. Our training materials will prepare them for the variety of challenges in directing and supporting employees. After all, organizational success is more likely to happen when employees are taken into consideration. They need to be thoughtfully encouraged and properly managed in order to reach their full potential within the workplace. Our training materials included in the Human Resource Bundle gives instructors flexibility in their training plan; not only with the variety of courses available, but also since they are fully customizable. You can adapt each course to accurately represent the real processes of your organization. Your students will experience training which has been specifically modified for their needs. Participants will be further engaged by their custom training experience, which means better results from your instruction.